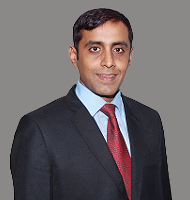 Saurabh has 14 years of experience in corporate and international business development in pharmaceutical and drug discovery contract research organizations, marketing (product/brand management), strategic planning, alliance and process management. He has worked across various geographies like Europe, North America and Asia wherein he created and built businesses from scratch. His experience is spread across multiple Indian pharma cos including Torrent Pharma, Piramal Enterprises and Dr. Reddy’s Laboratories where he worked in various businesses around branded generics and Drug Discovery service providers including Aurigene Discovery, AMRI Global and Panacea Biotech both in managerial and leadership roles. He is a Pharmacy graduate from Poona College of Pharmacy and has done MBA in Marketing and Finance from Symbiosys Institute of Business Management (SIBM), Pune. At Jubilant, he is Head of Business Development for US-West Region.